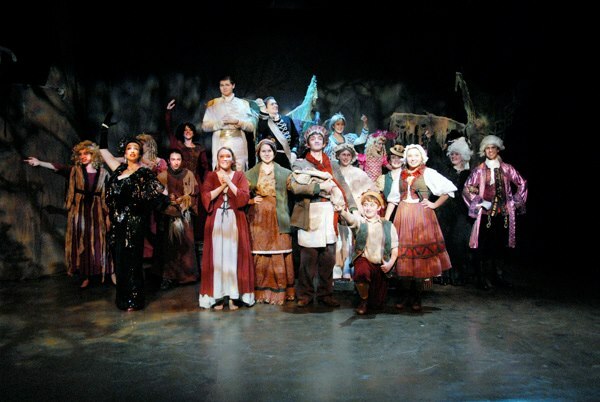 “Into the Woods” Cast A. Studio East 2013. Studio East fearlessly kicked off February with its triumphal production of Steven Sondheim’s difficult musical “Into the Woods”. Two casts take on the complex task of performing the limited run. “Into the Woods” tells the story of a childless Baker and his wife on a quest to remove a curse preventing them from having children. In their effort to lift the curse, they come across an assortment of fairy tale characters ranging from Cinderella, Little Red Riding Hood, Jack (and the beanstalk), a pair of Princes and others. Act 1 deals with each of the characters seeking their ‘happily ever after”, while Act II reveals the rarely seen consequences which follow their “happily ever after”. 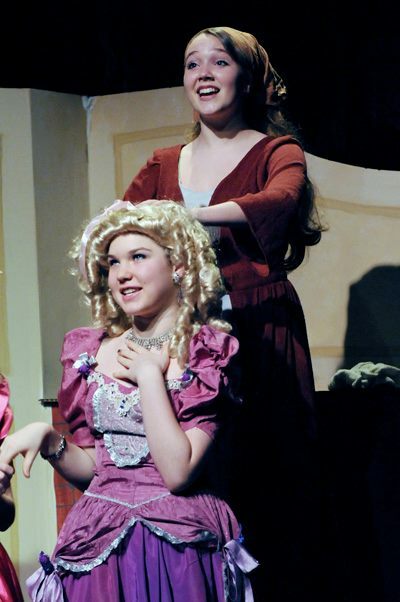 Cinderella (Tatum Ludlam) prepares Florinda’s hair (Clair Leon) for the Festival. “Into the Woods” Studio East 2013. Studio East compiled two incredibly talented casts for this production. There were a multitude of noteworthy performances and I am sure to miss many (my apologies in advance) but I would like to call out several. The Baker was well represented by Zach Barr, who brought a unique charisma and his strong vocal talent to the role. Both he and Henry Johnson (also playing the Baker) were effective in portraying the depth of conflict within the Baker; struggling to balance out his need to do the right thing and his desire to please his wife with a child at whatever cost. Henry Johnson positively beamed, doing a fantastic job of carrying the play in the production he was in. His scene with Jack (played by Dexter Johnson) in the tree awaiting the giant was captivating. The enchanting Tatum Ludlam succeeds in creating a lovably conflicted and vulnerable Cinderella. Always in the moment, she elevates each scene she is part of. Her voice clear and strong never wavers in the evocative and touching rendition of “No One is Alone” or the amusing “On the Steps of the Palace”. Her moments with the Baker (Zach Barr) were sweet and memorable. 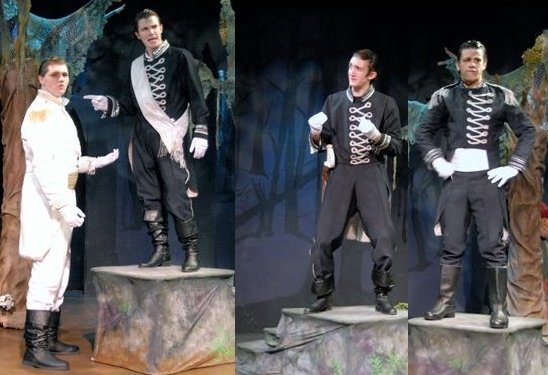 Both sets of Princes (Christian Obert and Christian Pflager; Zach Barr and Nigel Anders) succeed in achieving a conflicting love hate relationship with the audience, which abhors their self-centered portrayals but relishes their witty and tight duets of “Agony” and “Agony Reprise” and their innate charm. Looking ever like the classic debonair Disney Prince, Pflagler’s vocal talents and timing as Rapunzel’s Prince are undeniable, but he also awed the audience with a captivating rendition of the Wolf’s “Hello Little Girl” which was equally inspired and disturbing. The Dashing Princes: Cast A (Christian Obert and Christian Pflager) and Cast B (Zach Barr and Nigel Anders). Sean Ben-Zvi delivers a powerful performance as the Witch, showing off her amazing vocal and emotional range producing some of the plays more powerful moments, like “Children Will Listen”, “Lament”, “Last Midnight” and a riveting and emotional version of “Stay with Me” with Gwyneth Casey (Rapunzel). Casey as Rapunzel does a remarkable job of looking angst and conflicted throughout the production. Additional callouts for frequently overlooked work would be Thomas Kehoe, who did a phenomenal job in the role of the Narrator. He projected his lines with feeling, drawing the audience deeper into the play. The vast assortment of costumes were lavish and topnotch (Lani Brockman). Set designs were wonderfully detailed and effective in conveying the scenes (Marty Eagleson). The Stage Crew did an admirable job of executing the many scene changes. I am not sure who was responsible for Milky-White, but that was another crowd favorite. People can disagree on makes good theater. I believe it requires not only a compelling story, conflict and actors which inspire us to care about their character’s plight. It must walk the razor’s edge between entertaining and challenging the audience to consider something that they previously had not. It must linger with the audience at least for a time, after the performance has ended. Studio East’s production of “Into the Woods” navigates the lines successfully and delights on all levels. Prior to that weekend I never understood the show’s popularity. Granted, I had only ever seen the first few minutes of the Broadway production courtesy of Netflix but the odd syncopated, rushed, rap-style of the Witch in the opening scene had turned me off. Friday night in Kirkland was the first time I watched the show performed from beginning to end. As I sat observing the cast of aspiring young actors at Studio East perform, I began to get a sense of why “Into the Woods” has such passionate supporters. 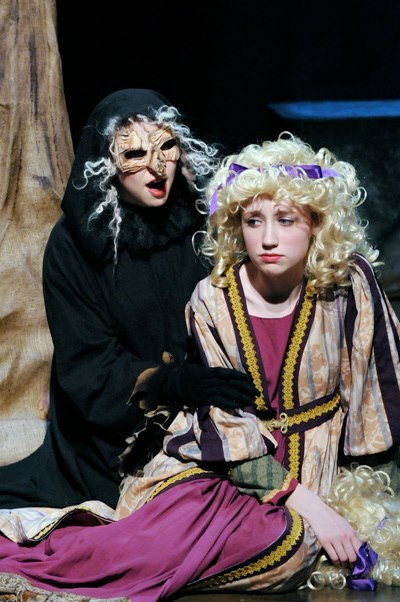 The Witch (Sean Ben-Zvi) appeals to Rapunzel (Gwyneth Casey) “Stay with me”. While I was not able to understand all of the lines during that show, partially due to the haste which with many of the lines are required to be recited and other times due to cast members not cheating forward a bit towards the audience when they spoke or being drowned out a bit by the music, somewhere in the midst of the show, I got it. I was hooked. I was so struck by the production that on Saturday, I watched the complete Broadway version. I then returned to Studio East on Sunday to watch the production again. An amazing transformation occurred as I went from being astonished that many would consider this musical to be one of their all-time favorites to joining their ranks, all over the span of one weekend.